Ford reduced its European pretax losses in the quarter by more than half, to $194 million from $425 million a year earlier. Ford cited higher sales volumes, lower costs and favorable currency rates. The unit remains on track to be profitable in Europe in 2015. DETROIT -- Ford Motor Co. today said its first-quarter net income fell 39 percent from the same period a year ago to $989 million on weaker pricing in the United States and higher warranty expenses. Profit margins in North America declined 35 percent, due to higher incentives and a $410 million increase in warranty reserves related to previously announced recalls and other service campaigns involving vehicles from past model years. Ford also said “weather-related costs” cut North American earnings by about $100 million. Revenue edged up less than 1 percent to $35.9 billion, Ford said in a statement. Ford CFO Bob Shanks characterized the quarter as “solid” despite the big year-over-year drop in net income. Shanks said the company increased its warranty reserves after initiating more recalls and other service campaigns in the last few years than anticipated. Shanks said Ford sets aside a reserve on each vehicle it sells and adjusts the amount based on the trends it is seeing. He said $340 million of the higher reserves related to costs fixing vehicles from the 2008-13 model years, while $70 million relates to two recalls of vehicles from the early 2000s. One of those recalls involves the Ford Escape and the other covers the Ford Crown Victoria and Mercury Grand Marquis sedans. In January, Ford said a recall of 161,000 Escapes from 2013 to fix a defect linked to 13 fires was the primary reason for $300 million in fourth-quarter warranty costs. “Our last couple years, we have seen more field-service actions than what we thought,” Shanks said in explaining the increase to warranty reserves. He said recalls and other actions to resolve customer complaints are becoming increasingly common across the industry as more technology is added to vehicles and because automakers can identify problems more quickly than in the past. Shanks said the higher warranty reserves, weather-related costs and $380 million in charges related to South American currency fluctuations reduced earnings by about $900 million, or 17 cents a share, meaning they more than accounted for the decline from a year ago. In North America, Ford earned $1.5 billion before taxes, down 37 percent from a year earlier. Revenue in North America declined 5 percent to $20.4 billion on lower sales, an unfavorable mix lower net pricing and the adverse effect of a weaker Canadian dollar. Margins for the region were 7.3 percent, compared with 11.1 percent in the same period of 2013. Factory sales slipped 2 percent to 717,000 units in North America. Ford said its market share declined, but that was partially offset by higher overall industry volume and rising dealer stocks. Shanks said North American margins would have been around 10 percent without the warranty and weather-related costs. 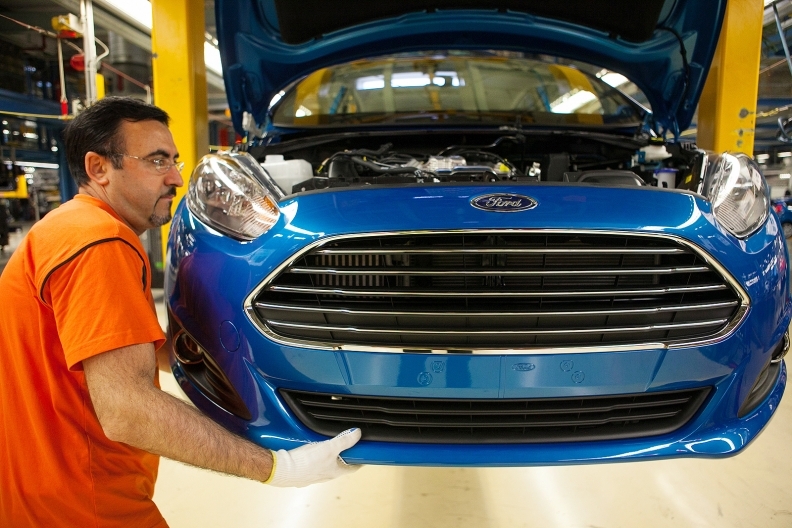 Ford’s loss in South America more than doubled from the same period a year ago, to $510 million. Devaluation of the Venezuelan currency accounted for $310 million of that loss, and similar issues in Argentina cost the company $70 million, Shanks said. He said Ford now expects a loss for the year in South America, with the first quarter accounting for a majority of it. Ford reduced its European pretax losses in the quarter by more than half, to $194 million from $425 million a year earlier. Ford cited higher sales volumes, lower costs and favorable currency rates. The unit remains on track to be profitable in Europe in 2015, Shanks said. Ford’s first-quarter automotive cash flow increased 71 percent from a year earlier to $1.2 billion. The company ended the quarter with automotive gross cash of $25.2 billion, up $1 billion, which exceeded debt by $9.5 billion. At Ford Motor Credit, wholly owned by Ford Motor, pretax profit fell 8 percent to $462 million, as revenue rose 18 percent to $2.0 billion. Ford warned in December that profits would decline in 2014, which it described as a transitional year amid the rollout of numerous redesigned vehicles. New versions of the Ford Mustang and its most lucrative nameplate, the F-150 pickup, will arrive at dealerships later in the year. Officials said today that the company is on track to generate a pretax profit for the year of $7 billion to $8 billion. “We are on track with our most aggressive product-launch schedule in our history,” CEO Alan Mulally said in the statement. Ford’s earnings results come a day after General Motors reported much weaker first-quarter profits. Costs associated with GM’s recalls of 7 million vehicles this year cut the company’s net income by 86 percent in the quarter, to $125 million. Record-high transaction prices in North America helped GM avoid a loss that many analysts had projected. Chrysler Group plans to report first-quarter earnings on May 6.